The celebrated writer1 chiefly attended to, has filled up above twenty pages in stating the question about the grace of God in conversion. The sum of which is, that there are some inward operations of the Spirit vouchsafed in that work; but that these only consist in representing divine truths to our understandings, and bringing them to our remembrance, and thereby raising some ideas in the brain, and making some impressions on it; which he allows to be physical, and irresistible in their production, and in which men are wholly passive; but utterly denies that any supernatural habits are infused, or that any supernatural aid is requisite to the conversion of a sinner besides the aforementioned. 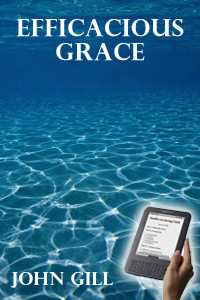 He observes that the word grace in scripture, always signifies the favor and goodness of God, but never any supernatural or infused habit: contrary to Rom. 5:20, 21, and 6:14, 2 Cor. 8:7, 9:8, 14, Col. 3:16, 1 Tim. 1:14, and 2 Pet. 3:18, with many others: yet owns, that the foresaid ideas raised in the brain, according to their nature, use, tendency, and effects, may be called either exciting, or restraining, or preventing, or assisting, or the subsequent of God; and may be either sufficient or efficacious, common or special. My business in the following Sections will be to prove, that the work of grace or conversion, is an internal one, wholly owing to the efficacious grace of God, and wrought in the soul by a supernatural, irresistible, and insuperable power, in the production of which man is purely passive; and to vindicate the passages of scripture made use of in proof of this doctrine, which are objected to. 1. It is said,3 that "this power is not consistent with the persuasions and exhortations used in Scripture to move men to repent, and turn themselves from their iniquity." I reply that the exhortations to repent and turn from iniquity do not regard the first work of conversion, or the inward work of grace upon the soul, which is here designed, but an outward reformation of life. Besides, supposing the exhortations referred to respect the internal work of faith and conversion, they may be attended with that power from God, who makes use of them, so as to produce such principles of life and grace, in which men are purely passive; by virtue of which they may become active, and be enabled to answer to such exhortations; even as the command of Christ to Lazarus to come forth was attended with such a divine power as produced a principle of life in him, in which he was purely passive; though by virtue of it he became active, came forth, and answered the word of command. 2. This is also said4 to be inconsistent "with a rational choice." I answer, that no doubt, whilst men are in a state of nature, they are able, without the special and powerful grace of God, to make a rational choice in things natural and civil, but not in things spiritual and eternal. How should they, when they are under the power of sin, influenced by their corrupt and deceitful lusts, and enslaved by Satan? Such men will always choose their own ways, for their soul delighteth in their abominations; which makes the powerful and efficacious grace of God necessary to enlighten their understandings, inform their judgments, guide their affections, and influence their wills. 3. It is urged5 that if this was the case, "it could not properly be said that they turned, but only that they were turned, to the Lord." To which may be replied, that when the Scriptures speak of the internal work of conversion upon the heart, it is expressed in the passive form, they were turned, see Jer. 31:18, 1 Pet. 2:25. And when they speak of external reformation, or of such a turning to the Lord as is the fruit of faith, then it is expressed in the active form, they turned to him, see Acts 11:21. 4. It is observed,6 that "this exposition is not agreeable to the words; for the apostle speaks not of the power exercised on us to render us believers, but of the power which shall be exercised on us who believe already." But nothing is more evident, than that the apostle speaks not of a power which shall be exercised on believers, but of a power which is exercised upon them, and is continued to be so; and is the same with that which was put forth when they first trusted in Christ, and must be continued to carry on and perfect the good work. Now, if the exceeding greatness of God’s power is necessary to carry on and perfect the work of faith, it must be much more so to produce, plant, and form it at first. It is asserted,7 that the apostle speaks "not of the power to be exercised on our souls, to raise them from a death in sin to a life of righteousness, but of the power to be exercised on our dead bodies, to give them a glorious resurrection to eternal life, as he had none already in the body of our head Christ Jesus." But though the apostle, in order to illustrate that power which is exalted towards them that believe, takes notice of the power which was wrought in Christ when he was raised from the dead; yet he says not one syllable concerning the resurrection of the saints. Moreover, the apostle is speaking not of a power to be exercised, but of one that is now exercised upon believers; whereas the resurrection of our dead bodies is an act of God’s power, which is to be exercised; it is future, yet to come. Besides, this power is limited to believers; whereas the resurrection of the dead will be both of the just and unjust; and the resurrection of the one will be as much an instance of the exceeding greatness of God’s power, as the resurrection of the other. Add to this, that at the resurrection the people of God will no longer bear the character of believers, (for faith will be changed into vision,) but that of saints and just men, being in themselves made perfectly so; whereas the subjects of this power are such who believe. To conclude, these words stand in connection with Eph. 2:1: And you hath he quickened, who were dead in trespasses and sins, which is the plain instance of God’s power the apostle had in his view; for all that is said between them, concerning the resurrection, exaltation, and headship of Christ, may be read in a parenthesis, and are only mentioned to illustrate and set forth the exceeding greatness of the power of God in this instance of it. 1. "That this metaphor affords no certain proof that wheresoever it is used, the person it respecteth must be purely passive, and have done nothing towards the act styled creation, is evident from Isa. 43:1, 54:16." To which I reply, that if the metaphor elsewhere used affords no certain proof, that the person it respecteth must be purely passive, and have done nothing towards the act styled creation, yet, if it does in the instances before us, it is sufficient to our purpose; now nothing appears to the contrary. And, indeed, the other passages referred to are far from making it evident, that the metaphor affords no certain proof of the person’s passiveness whom it respecteth; not Isa. 43:1, where God is said to have created Jacob, and formed Israel, which is not to be understood literally of the people of the Jews, when God formed there as a nation, or body politic, or when he constituted them to be his church and people, and they entered into covenant to have him for their God; but of the elect of God, whether Jews or Gentiles, as appears from verse 5-7, 19-21, compared with 1 Peter 2:9, 10, and designs this new creation work of grace upon their souls in effectual vocation; by which God forms them for himself, that they may show forth his praise. Now, though they are active in showing forth the praise of God, yet are entirely passive in being created and formed for that purpose. So in the other instance, in Isa. 54:16: I have created the waster to destroy. Though the waster is active in destroying, yet he is purely passive in being created, appointed, and raised up to destroy. 2. It is urged,9 that man is not holy passive in the case before us is "certain, from the nature of faith and godly sorrow, which are men’s acts, and not God’s, and from God’s frequent calls upon the wicked to turn from their transgressions to the Lord." I reply, that when we say that men are passive in the work of grace upon them, we speak not of the exercise of grace, in which, it is allowed, men are active, but of the implantation and production of grace in them. Though men, and not God; believe and repent, yet faith and repentance are the gifts of his grace and the produce of his power. And though they are active in turning to the Lord, yet this is in consequence of their being first turned by him. Besides, God’s frequent calls to men to turn themselves, regard not the first work of conversion, but an external reformation of life, as the fruit, effect, and evidence of it. 3. It is further observed,10 that "God is, in Scripture, said to create that which he brings into a new and better state, as in Psalm 51:10, Isa. 65:17, 19. To this sense the Scripture plainly leads us, when it saith, If any man be in Christ, he is a new creature. And all the Greek fathers confirm this exposition, by saying, that this new creation only importeth, me,taijbolh. eivj to. krei/tton, a change for the better." Admitting that this is the sense of the word create, in the places cited, and that the sense of the Greek fathers is just, the question before us is not whether this new creation is a change for the better, but, whether this is to be ascribed to the irresistible and efficacious grace of God, in which man is passive, or to the active power of man’s free will. But neither the sense of the Greek fathers is just and proper, which seems to imply that man, before this new creation, was in a good state, though this changes him into a better. Whereas this is not an improvement of what he was, or had before, but an infusion of that into him which he had not. Nor does it appear so manifestly to be the sense of the word create, in the places referred to; not in Psa. 51:10, Create in me a clean heart, which strongly expresses the sense David had of his fall, of his own inability to help himself, and of his need of so much of divine power to restore him, as is put forth in an act of creation. And from hence it may be rightly concluded, that if a fallen believer, who has the grace of God in him, is not able to create a clean heart in himself, much less able is an unregenerate sinner. Nor in Isa. 65:17, where it is said, Behold, I create a new heaven, and a new earth; since it follows, and the former shall not be remembered, nor come into mind. Nor in verse 19, Behold, I create Jerusalem a rejoicing, and her people a joy; which will be done, not barely by renewing, or bringing into a better state the former individuals, which before constituted Jerusalem, or the church, but by an immediate thorough conversion of multitudes, which shall be added to her; for then the earth shall be made to bring forth in one day, and a nation shall be born at once (Isa. 66:8). Much less in the text before us, seeing it is immediately added, Old things are passed away; behold, all things are become new. This new creation is not an improvement, or a mending of the old principles of nature, but an infusion of new ones, and so is properly styled a creation. 1. That "the falsehood of this argument is evident from this consideration, that this new birth is ascribed to the word and ministers of God (Rom. 10:17; 1 Pet. 1:23; Jam. 1:18; 1 Cor. 4:15), who work upon us by moral suasion; and since this cannot import, that they produce it by an irresistible action, in which we are purely passive, it will not follow that God, or his good Spirit, doth so convert men, because they are said to be born of God, or of the Spirit." To which I reply, that though faith comes by hearing, and we are said to be begotten by the word of God and truth, as a mean, yet faith is a gift of grace, and of the operation of God (Eph. 2:8; Col. 2:12; 2 Thess. 1:11); which work of faith, as it will be fulfilled, so it is begun and carried on by the power of God, which can never be resisted so as to be overcome. And though ministers are represented as spiritual fathers, yet they are only instruments by whom we believe; and were no more done, than what is the effect of moral suasion through them, the work would never be done at all. Moreover, it does not follow, that because they do not and cannot produce this work by an irresistible action, in which we are passive, that therefore God does not convert men in such a way; since it is certain he makes use of them in such a manner, as that the excellency of the power may appear to be of God, and not of man (2 Cor. 4:7.) Besides, we are never said to be born of the word, or of ministers, but by them; whereas we are said to be born of God, and of the Spirit, which is expressive not of bare means, or mere moral suasion, but of the powerful efficiency. 2. It is observed,12 that this "phrase is used by the Jews concerning their proselytes, they being then said to be recensnati, newborn babes; and from them our Lord translates the metaphor to his disciples, renewed after the image of God in true holiness, and sanctified throughout in all their whole man." But the phrase of being born of water and of the Spirit, is never used by the Jews concerning their proselytes. It is true, indeed, they have such a saying as this, dlwnv ymd rg ryygtnv !wfqk, One that is made a proselyte, is like a child new born:13 but then they used this not in a spiritual but in a civil sense, signifying by it, that such ceased from all natural and civil relations to parents, masters, etc. Such an one might marry his mother, or mother’s sister, be no longer under obligation to a master, standing no longer in any relation to them, being as a newborn babe; and might be admitted, in civil cases, as a witness equally with a Jew, with many other things of the like nature.14 And admitting that our Lord had reference to the use of this phrase among the Jews, it was to show, that another kind of birth was necessary to the enjoyment of the kingdom of God, that either the Jews, as being the descendants of Abraham, or than the proselytes, by coming over to the Jewish religion, had. Besides, since in the objection it is observed, that this metaphor is translated to such who are renewed after the image of God in true holiness, and sanctified throughout in all their whole man; yea, it is added, that there is such intrinsic change in the whole spirit, soul, and body, that they may be said to be much more other men, than Saul, when the Spirit of prophecy came upon him: and seeing it is owned, that this change is wrought within us by the operation of the Holy Spirit, why should it not be ascribed to the unfrustrable and irresistible power and grace of the Spirit, in which men are entirely passive? 1. "A dead body is void of all sense; whereas the unregenerate man is often under strong convictions, and a deep sense of his present misery." To which I reply, that it is one thing for a man to be under strong convictions, and a deep sense of his present misery, or of the evil and mischief which comes by sin, which sense is purely natural; and another thing to be under real convictions, and a deep sense of the true evil and wickedness that is in sin, which is purely spiritual, and arises from the quickening influences of the Spirit of God. 2. A dead man cannot awake himself out of the sleep of death; but God saith to the spiritually dead man, Awake, thou that sleepest, arise from the dead, and Christ shall give thee life, it should have been light (Eph. 5:14). I reply, that these words are not spoken to the spiritually dead, but to professors of religion, as abundantly appears from the context; who were fallen into a drowsy, sleepy frame, which was very much owing to their conversation with dead sinners: wherefore the Apostle exhorts them, to rouse themselves from this lethargy, and arise, and depart from their dead companions, and unfruitful works of darkness, when they might expect more light and liveliness in their souls from Christ. 3. "A dead man cannot hear: but to the spiritually dead, God saith, Hear, and you souls shall live (Isa. 55:8)." To which may be replied, that there is a twofold hearing of the word; an external one, which regards the outward ministry of it, and an internal one, so as to understand it; the former, men spiritually dead may be capable of, but not of the latter; (see John 8:43, 47). Besides the persons spoken to in the passage of Scripture cited, were not spiritually dead, but were such as were quickened, who had a principle of spiritual life implanted in them. In consequence of which, they thirsted after spiritual things, verse 1, though greatly distressed under a sense of their spiritual poverty. Wherefore, the Lord encourages them to hearken to him, and listen to his covenant, grace and promises, that they might live comfortably. 4. "It would be absurd to exhort a dead body to turn about and live; whereas God thinks it not incongruous to say to persons spiritually dead, Turn yourselves, and ye shall live" (Ezek. 18:32; 33:11). I reply, that the passages referred to, do not regard such who were spiritually dead; since they concern the whole house of Israel, and every one of them: of whom it cannot be said, that they were dead in trespasses and sins: nor do the exhortations relate to the first work of conversion, but to an external reformation of them as a body politic, that they might peaceably live in their own land, and comfortably enjoy the good things of it. 5. "Good Christians are said to be dead to sin (Rom. 6:2, 11); to the law (Gal. 2:19), and to the world (Gal. 6:14)." Now if hence we cannot truly argue, that they cannot sin at all, that they can do nothing relating to the world, or to the law; neither can we argue from the metaphor of being dead in trespasses and sins, that we can do nothing in obedience to the calls of God, or compliance with the motions of his word and Spirit. To which I reply, that the meaning of the phrases in the passages mentioned is, that believers are freed from the damning power of sin, and from the curse and condemnation of the law, and are delivered from this present evil world. Now, whereas we can truly argue from hence, that believers are so dead to sin, the law, and the world, and these to them, as that they cannot condemn, damn, or destroy them; so we can truly argue from the metaphor, of being dead in trespasses and sins, that men can do nothing spiritually good, until God powerfully calls them by his grace, and they feel the quickening influences and motions of his Spirit. 2ndly In answer to the argument from these Scriptures, it is observed,16 that "both the places cited concern only the Gentile world; and so we cannot argue from those words, which do so certainly relate to the worst of Heathens, that this must be the natural state of all men: or, that the same power is requisite to convert the unregenerate Christian, and the worst of Heathens." I reply, that these persons spoken of were Heathens, is readily granted; but that they were the worst of Heathens is not so manifest, though, probably, they were as bad as any. However, I cannot but take notice of the unregenerate Christian, as a mere paradox, a contradiction in terms; since no man can be truly a Christian but he that is regenerated by the Spirit of Christ. But, passing these things, let it be observed, that the same character of being dead in a moral or spiritual sense, is given to unregenerate Jews, which is here given to the unconverted Gentiles (Matthew 8:22; John 5:25). For that they were Jews, and not Gentiles, our Lord speaks to and of in the places referred to, is evident from this consideration, that as yet the Gospel was not sent to the Gentiles; nor were there any among them as yet who heard his voice or followed him. Nothing is more a certain and true than this, that he, or she, that liveth in pleasure, whether Jew or Gentile, are dead while they live. Besides, the a apostle says the very same things, in the same words, of himself, who was a Jew, and a devout one, and of others, while unconverted, as he does of these worst of Heathens (Eph. 2:4, 5). So that we may truly argue, and safely conclude, that this must be the natural state of all men; and that the same power is requisite to convert an unregenerate Jew, yea, an unregenerate man living where Christianity is professed, and the worst of Heathens; since the same characters belong to them. 1. That18 "the natural man here is not barely the unregenerate man; but the wise man, and disputer of the world, who will admit of nothing but what he can see proved by reason; and so receives not things revealed by the Spirit." I reply, admitting this sense of the phrase, it follows, that if an unregenerate wise man, one of the greatest abilities, and most refined parts, in whom reason is sublimated, and wound up to its highest pitch it can well be, in unsanctified nature, cannot know and receive spiritual things; then an unregenerate foolish man, or one of meaner abilities, and of a lower rank and size, can never, as such, understand and embrace them. The apostle has pitched upon in instance which must necessarily conclude all men that are unregenerate, in a state of ignorance of spiritual things, and in an incapacity of knowing them, without the special illuminating grace of the Spirit. 2. That19 "the apostle speaks not of the inability of a Heathen to understand the meaning of any revelation discovered unto him: for how, then, it is asked, is it discovered to him? but of the necessity of a supernatural revelation, that the hidden wisdom of God might be made know to the world." In answer, a Heathen, whether a philosopher, or a man of a more ordinary size, may be capable of understanding the literal, grammatical meaning of a revelation made to him, even of the external revelation God has made to the world; as that the import of it is, among other things, that Jesus is the Messiah, was born of a virgin, suffered, died, and rose again, and thereby procured salvation for men; and yet, have no spiritual sense and apprehension of these things, any relish for them, gust of them, or faith in them; all which he will remain a stranger to, unless accompanied with a special, internal revelation, and application of them to him by the Spirit of God. The necessity of which, and not of an external, supernatural revelation, the apostle here demonstrates; for the latter, the natural man, whether among Jews or Greeks, had; otherwise, it could not with any propriety be said, that he receiveth not, or rejects these things, and accounts them foolishness; which were in consequence of an external, supernatural revelation made in the ministry of the apostles, who preached Christ crucified, to the Jews a stumbling-block, and to the reeks foolishness (1 Cor. 1:23, 2:4); it being with respect to them unattended with the demonstration of the Spirit and of power. 1. It is said,20 that this argument, "if it proves anything, proves too much; namely, that we are not sufficient of ourselves, logi,sasqai, ti, to think anything at all, whether it be good or bad." I reply, that neither the words of the apostle, nor our argument upon them, prove so much; nor the words of the apostle; since by ti, anything, he means either any good thing, or any evil thing, or any thing that is neither good nor evil; not any evil thing, for the imagination of the thoughts of man’s heart is only evil continually (Gen. 6:5), nor any thing that is neither good nor evil; for men are capable of themselves of thinking of things natural and civil, which, in a moral sense, are neither good nor evil. It remains, then, that he means any good thing which respects God, and Christ, and faith in them; as when our Lord says, Without me ye can do nothing (John 15:5); his meaning is not, that we can do no natural or civil action of life, or no evil action, without him, but no good one. Nor does our argument, on these words of the apostle, prove so much; since it is limited to things which are spiritually good. Moreover, the logi,sasqai, here used, does not signify barely to think, but to think with judgment and affection (see Phil. 4:8), which no man, with respect to spiritual things, is capable of without the grace of God. 2. It is urged,21 that "the words relate to the apostles, and to them alone, and are a declaration of their own insufficiency to carry on the great work of conversion of the world to the Christian faith by their own strength and wisdom, without the illuminations and powerful operations of the Holy Ghost." To which I answer, that the apostle is indeed speaking of the ministry of the Gospel by him and others, and of the success of it, and of their trust and confidence through Christ concerning it (vv. 3, 4); yet in these words he speaks in general terms; Not that we are sufficient of ourselves, to think anything as of ourselves, either with respect to the work of the ministry, or the conversion of souls, or our trust in God, or anything else that is of a spiritual nature: but our sufficiency, for every spiritual work, is of God. And then he proceeds to take notice particularly of their fitness for the ministry they had of God. Who also hath made us able ministers of the New Testament. Whereas, if the words in the fifth verse relate particularly to the sufficiency the apostles had from God for the work of the ministry he must be guilty of a very great tautology in the sixth verse; for the sense of both must be this; We are not sufficient for the work of the ministry of ourselves, but our sufficiency for it is of God; o]j kai., who also hath made us sufficient ministers of the New Testament. Besides, if the apostles were not sufficient of themselves to think, study, or collect anything together, fit for the ministry of the Gospel, and so as to be useful to the good of souls, much less must a natural man be able to think any spiritual good thing, and still less be able to do anything towards his regeneration, or in the real work of faith and conversion, which is entirely owing to the efficacious grace of God. 1. It is objected,22 that "these words of Christ are spoken expressly to those who were abiding in Christ, and truly believed already." Be it so; if such were not able of themselves to do anything that is spiritually good, much less able are they who have no abiding in Christ, or true faith in him. 2. It is said,23 that these words being spoken to the twelve apostles, "signify, that without the gifts and powerful assistance of the Holy Spirit, who belonged only to them that abode in Christ, they could do nothing to convert the world." I reply, though these words are spoken to the apostles, yet not to them only; for our Lord’s words throughout the context are so expressed, as that may be applied to any other persons under a profession of faith; much less are they spoken to them as apostles, but as in union, with Christ, believers in him, professing faith in him, as branches in him the vine, deriving all their grace, life, liveliness, and fruitfulness, from him, by which they performed every spiritual action; all which are far from being peculiar to them as apostles. Moreover, this sense of the words makes Christ to stand for the gifts and assistance of the Spirit; whereas the phrase without me; signifies separate, or apart from him, that is, from his person and grace, and not the gifts and assistance of his Spirit. Besides, it is not true that the Holy Spirit, with respect to his gifts and assistance, qualifying for and succeeding in the work of the ministry, only belonged to them that abode in Christ; since many may, and have had the Spirit in this sense, as Judas, who never had any real being or abiding in Christ. 3. It is observed24 from Gataker, "that cwri.j evmou/,without me, is the same as cariqe,ntej avpV evmou/, being separated from me, ye can do nothing; which, if we extend to all true Christians, only signifies, that "without abiding in the faith, they cannot be faithful in the faith; and without their continuing united to Christ by the Spirit, they cannot bring forth the fruits of the Spirit." It is certain, that men without abiding in the faith, can never be faithful in it; and without continuing united to Christ, cannot bring forth the fruits of the Spirit; though all that are truly in the faith shall abide in it, and such as are really united to Christ, shall continue so, and bring forth fruit. But then, if these cannot bring forth fruit without abiding in the faith, and continuing united to Christ, how should such bring forth fruit who never were in the faith, nor in Christ? Gataker’s observation, and which is also Piscator’s, is a very good one; and the sense of the words it confirms is this; that could the apostles, or any other believers, be supposed to be, or could possibly be separated from Christ, they would not be able to do anything that is truly and spiritually good. And if so, how should such who are cwri.j Cristou/, without Christ (Eph. 2:12), as all unregenerate persons are, be capable of doing anything of that nature? It is true, they may be able to attend to the hearing of the word, by which faith comes, may ask, seek, and knock for the good Spirit, may consider of the ways of God, and turn their feet to his testimonies; but unless they are renewed by the Holy Ghost, are created in Christ Jesus, and have faith in him, they will not be able to do these, nor anything else in a spiritual manner. The Remonstrants themselves own,25 "that man in a sinful state, cannot of himself think, will, or do that which is truly good, and that it is necessary that he should be regenerated, and renewed of God in Christ by his Holy Spirit, in the understanding, affection, and will, and in all his powers, that he may be able rightly to understand, meditate, will, and perform that which is truly good; as it is written, Without me ye can do nothing." 1. This passage of Scripture is no inconsiderate proof of the doctrine of the powerful and efficacious grace of God in the work of faith and conversion. To come to Christ, is to believe in him. This is not to be attributed to the free will and power of man, but is owing to the Father’s drawing; which is to be understood not of moral suasion, but of the internal and powerful influence of his grace. This act of drawing, is an act of power, even almighty power; as appears from its being something distinct from and superior to both doctrines and miracles. The Capernaites had heard the doctrine of Christ, which was taught with authority, and had seen his miracles, which were full proofs of his being the Messiah; and yet believed not, but continued murmuring at his person and parentage. This gave occasion to Christ to observe to them, that something more than these was necessary to their coming to him, or savingly believing in him, even the powerful and efficacious grace of the Father in drawing. Besides, if this act of drawing was only an act of moral suasion, and not of almighty power, then a lesser action is ascribed to the Father who sent Christ, than is to Christ himself; though he is here spoken of as Mediator; since he takes to himself the power of raising such up at the last day who come unto him, which must be allowed to be an act of omnipotence; when moral suasion is what belongs to every ordinary minister of the word. Add to this, if it be considered what men, in conversion, are drawn off from and to, from their beloved lusts and darling righteousness, to look unto and rely upon Christ alone for salvation; from what was before so very agreeable, to that which, previous to this work on their souls, was so very disagreeable; to what else can this be ascribed, but to unfrustrable and insuperable grace? But then, though this act of drawing is an act of power, yet not of force: God, in drawing of unwilling, makes willing in the day of his power; he enlightens the understanding, bends the will, gives a heart of flesh, sweetly allures by the power of his grace, and engages the soul to come to Christ, and give up itself unto him; he draws with the cords of a wan, with the bands of love (Hosea 11:4). Drawing, though it supposes power, yet not always co-action, or violence. Music draws the ear, love the heart, and pleasure the mind, trahit sua quemque voluptas.26 The Jews have a saying,27 that the proselytes in the days of the Messiah shall be ~yrwrg ~yrg ~lwk, all of them proselytes drawn, that is, such as shall freely and voluntarily become proselytes. 2. In answer to this sense of the word,28 it is said, "that to be drawn of God, cannot import our being moved by any inward and irresistible impressions to believe in Christ; for then no man could come to Christ without this irresistible impression; and then no other person could be blame-worthy for not believing on him, because they could not do it without that powerful attraction which God was not pleased to afford them nor could it be praiseworthy to believe in him, because they only did so when they could not choose but do it, as being moved in so doing by a force they were not able to resist." To which I reply, that if by an irresistible impression, is meant such an internal influence of the grace of God upon the soul, which, though opposed, cannot be resisted so as to be overcome, and rendered in effectual, we affirm, agreeable to these word of Christ, that without this no man can come to him; yet, notwithstanding this, persons may be blame-worthy, as the Jews were, for not believing on him as the Messiah; though without this powerful attraction they could not come to him, and believe in him to the saving of their souls. Besides, though the ability of coming to Christ in a spiritual manner is owing to the powerful grace of God in drawing; yet the disability of coming to Christ does not arise from a defect, or want of that powerful attraction, but from the corruption and vitiosity of nature, which being blame-worthy, what springs from it must be so likewise. Moreover, we readily know, that it is not praise-worthy in men to come to Christ, and believe in him, but that all the praise is due to God, and to his efficacious grace, by which they are what they are in conversion; since faith is the gift of God, and of his sole operation: nor could any come to Christ, unless it were given unto him of the Father; and therefore he ought to have all the praise and glory. (2.) It is said,30 to be drawn by the Father signifies "to be moved by the great promise of eternal life confirmed by these miracles to do it; for where there is a firm belief, and lively sense of that inestimable blessing, it must strongly engage to come to Christ, from whom it is only to be expected." To which I answer, eternal life is, indeed, only to be expected from Christ; and when there is a firm belief and lively sense of it, as in him, and to be had from him, persons will be strongly engaged to go to him for it: but then, what is it that gives that firm belief, and fixes that lively sense of this blessing, so as strongly to engage to come to Christ for it, but the powerful and efficacious grace of God? The bare external revelation of the promise, though confirmed by miracles, will not do it. Instructions by the ministry of the word are not sufficient, unless accompanied with the demonstration of the Spirit, and of power. The following words are not a proof of it, It is written in the prophets, And they shall be all taught of God; every man therefore that hath heard, and hath learned of the Father, cometh unto me (John 6:45): which do intend mere external instructions, or objective teachings, for multitudes are in that way instructed who never come to Christ; but special teachings, such as are attended with the energy of divine grace, with the laws and doctrines of Christ put into the inward part, and written on the heart. Add to all this, our Lord himself explains what he means by the Father’s drawing (v. 65), where he says, No man can come unto me, except it were given unto him of my Father; which is more than affording means and motives, it is giving faith itself. What is said to answer to the argument from Matthew 7:18, and Romans 8:7, will be considered hereafter in the next chapter. 1. To confront this, it is said,31 "What God commands we must do; and therefore must be active in it: but God commands all men every where to repent (Acts 17:30), and to believe in the name of Christ (1 John 3:23), therefore we must be active in the works of faith and repentance." To which I reply, that though what God commands is the rule of man’s duty, yet not the measure of his strength. It is no good arguing from God’s commands, to man’s power in his present state. God requires men to keep the whole law; it does not follow from thence, that they are able to do it. So, though it is his commandment, that we should believe in his Son Jesus Christ, and repent; yet it is certain, that faith is not of ourselves, it is a gift of grace, and of the operation of God; and the same may be said of repentance. Moreover, though believers are active in the exercise of the graces of faith and repentance; for it is the convinced sinner, and not God or Christ, or the Spirit, who repents and believes; yet in both men are purely passive in the first production and implantation of them in their hearts. But we are told,32 that; it by this way of arguing, the Jews must have been purely passive in all their hardness of heart, Ahab’s false prophets in lying, the enemies of God’s church in all the evils they do to her, and in the blasphemies they utter against him; because God is said (Rom. 11:8; 1 Kings 22:23; Rev. 6:4, 8; 13:5, 7), to give a spirit of slumbering, a lying spirit, power to take peace from the earth, and a mouth speaking blasphemies. To which I answer, that these judicial acts of God, and as such the persons to whom they relate, were indeed passive in them, these being purely God’s acts, and not man’s; and yet the Jews were active in hardening their own hearts, Ahab’s prophets in following the suggestions of the lying spirit, and the enemies of God’s church in using their power to make war with the saints, and in opening their mouths in blasphemy against him. 2. This is laid down33 "as a general and rule, that where God is said to give any thing, the exercise of that faculty is still supposed which he hath given us already; and God is only said to give it by giving those faculties by which we are enabled to obtain it, and the means and motives which are sufficient to excite those faculties to the performance of their proper actions. Thus it is always with respect to natural and spiritual gifts; for thus God giveth riches and wisdom. Thus the Jews say, that God hath given repentance to the Gentiles, when, by Peter’s preaching to them peace through Jesus Christ, and promising remission of sins upon their repentance, they repented, and believed in Christ. So faith is said to be the gift of God; because the objects of it are only by divine revelation made known, and are only confirmed, and made credible by the testimony God hath given to them." But though the Gentiles repented, and believed in Christ, upon Peter’s preaching peace and pardon to them through him; yet it was not through the strength of their natural faculties, or barely through means and motives, exciting their faculties to the performance of these actions, but through the power of the Holy Ghost; for while Peter yet spake these words, the Holy Ghost fell on all them that heard the word (Acts 10:44); who produced in them these graces of faith and repentance, and assisted them in the exercise of them on their proper objects. Besides, if God may be said to give faith and repentance to men, when he only gives the means of them, and motives to them, he may be said equally to give faith and repentance to men, who do not believe and repent; which is a contradiction in terms, provided they have the same means and motives as those who do. And so Chorazin, Bethsaida, and Capernaum, may be said to have faith and repentance given them; because they had the means of them, and motives to them; the doctrines of Christ were preached unto them, and his mighty works done among them; though our Lord upbraids them with their impenitence and unbelief. So, when faith is said to be the gift of God, if no more is meant by it, than that the objects of it are made known, confirmed, and rendered credible by a divine revelation; then all those may be said to have it given to them, to whom the objects of it are so made known and confirmed. Whereas there are multitudes, who through the external revelation of the word, know that Christ is the object of faith, and yet have no true faith in him. Therefore more is meant than this, even the donation of the grace itself; for it is given to men to believe, even actually to exercise faith. To which is required, besides the confirming evidence of revelation, the power and grace of God; for no man can come to Christ, that is, believe on him, except the Father draw him. Nor is it always true, with respect to natural gifts, that God gives riches and wisdom to men, when he gives them faculties, means, and motives of getting wealth and wisdom (see Eccl. 9:11). When he does give riches and wisdom, he gives more than barely faculties, means, and motives to get them; he gives riches and wisdom themselves: so when he gives faith and repentance, it is not merely natural faculties capable of them, or the bare means of them, or motives inducing to them, but the things themselves. 1. It is owned,34 that "God inclined Lydia to do this; but the only question is said to be, whether he did it by any extraordinary and irresistible influence? This it seems reasonable to deny." But, why should it seem reasonable to deny it? Surely, that action which overcomes resistance, and takes out of the way every thing that obstructs, must needs have an irresistible influence. Now, such is this action of opening a poor sinner’s heart; it overcomes the opposition within, and removes that which shut, and kept the heart shut to every thing that is spiritually good, and, therefore, must be done by an irresistible influence. Our author proceeds, and reasons thus: "Either she alone was avxi,a, prepared, disposed, and fitted to receive this influence, and then she had done something already towards her conversion; or if it were absolutely necessary that; she might believe, and yet she alone, though no more fitted or prepared for it than the rest, received it; the other auditors for want of this extraordinary influence, must lie under a necessity of not believing; and so it could not be blame-worthy in them, that they did not believe." I reply, whether Lydia was the only person or no converted, at this time, is not certain, no mention is made of any other; and that she was fitted and disposed to receive this influence does not appear, no not from her being sebome,nh to.n Qeo.n, one that worshipped God; for in Antioch there were many of these sebome,nwn gunai/kwn, devout and honorable women, who were so far from being fitted and disposed to believe, that they raised a persecution against Paul and Barnabas, and expelled them out of their coasts (Acts 13:50). And had she been fitted, prepared, and disposed to receive this influence, it does not follow that she had done something towards her conversion, since this might be, and yet no conversion; and, besides, this disposition might be of God, and not of herself. On the other hand it is urged, if she was no more fitted for it than others, and yet received it, the rest, for want of it, must lie under a necessity of not believing, and so could not be blamed for their unbelief. But it should be observed, that though such is the condition of man by the fall, that he cannot believe in Christ, without the powerful influence of divine grace, which God is not obliged to communicate; yet, it is not the withholding of that influence, or denying that grace, which lays him under a necessity of not believing, but it is the corruption of his nature that lays and holds him in the chains of unbelief; and, therefore, his unbelief is not to be imputed to the want of this powerful influence, which God is not obliged to give, but to the vitiosity and wickedness of his heart, on which account he is justly blame-worthy. 2. It is alleged,35 that "to open the heart, and to open the ear, are Scripture phrases of like import; for the effect of both is the same, namely, the rendering the person willing and inclined to do the thing. Now this God sometimes does by his afflicting hand, and sometimes by the preaching of the word; so that they, who have their hearts affected with, and inclined by it to what is good, may be said properly enough to have their hearts opened by it." To which I reply, that both the opening of the ear and of the heart are God’s acts, and not man’s: and, though God sometimes does these things by afflictions, and by the preaching of the word, as moral instruments, yet neither the one nor the other will ever produce them, without the mighty power of his Spirit and grace accompanying them: and, whereas it is said, that such who have their hearts affected with the word, and inclined by it to that which is good, may be said to have their hearts opened by it. But who, or what is it that gives and produces this affection and inclination? All that hear it are not affected with it, and inclined by it: to what else can this be ascribed, but to the powerful and efficacious grace of God? 3. It is observed,36 that "God is here said to open the heart of Lydia, not to believe, but only prose,cein, to attend to the things spoken of Paul; that is, to weigh and seriously consider of the greatness of the blessings promised to believers, namely, remission of sins and eternal life; and that attention produced faith in her." I reply, that it is true, that faith comes by hearing, and attending to what is heard; but it is neither hearing nor attention that produces faith, but the grace and power of God: hence it is said to be the work of God, and of the operation of God (John 6:22; Col. 2:12). And, if such an act of God’s grace and power, as the opening of the heart, is necessary, to a proper, profitable, and useful attention to the word, and to a serious consideration of the blessings of it; how much more necessary must it be to the work of conversion, to true saving faith in Christ? 1. In answer to such texts as these, in general, this is laid down as a most certain rule:37 "that when God doth require us to do what he himself doth promise, and hath made it our duty to perform, his promise is only to perform what is requisite, on his part, towards the work." But this author should have informed us what that is which is requisite on God’s part, and what that is which is man’s duty to perform, towards the work of conversion. Whereas nothing is more certain, than that God does both require of us to do, and he himself promises to do, the whole work of conversion; which he does not by persuasion, or laying before us inducements to it, as is suggested, but by unfrustrable influence. And yet his command to do it does not imply that we are gods, or have equal power with him, as is intimated; nor does praying to him for the performance of what he requires of us, and he has promised, suppose a desire to be excused from obeying his commands. The commands of God show his authority, and man’s duty; the promises of God discover his grace and power, and are a relief to man’s weakness, which no way lessen his obligation to duty. 2. It is observed,38 that "the same God, who promiseth to circumcise the hearts of his people, requires them to circumcise their own hearts (Deut. 10:16; Jer. 4:5). And it is suggested, that the promise is conditional, namely, if they would call to mind the blessings and curses he had pronounced (v. 1), and turn to the Lord (v. 2), and that it is made to all their seed, to nations, and not particular persons." I reply, that the passages referred to have been considered in the former part39 of this performance; and as to the conditions mentioned, if they are conditions, they are not conditions of the circumcision of the hearts of God’s people, but of turning their captivity. And though this promise is made to their seed, as well as to themselves, yet not to all their seed, much less to nations. Besides, it particularly regards the time of the Jews’ conversion, when all the elect of God among them shall be saved. 3. It is said,40 that "seeing God so frequently requires of the same persons, that they should turn themselves from their transgressions, promising life to the penitent, and threatening those that would not with death; and seeing he complains so oft of his own people, and of that very Ephraim which made this prayer, that they would not turn to him; it must be absurd to urge this prayer to excuse men from a duty required by God under such dreadful penalties." To which may be returned: that the duty required by God, in the places referred to, does not design internal conversion, but external reformation; which latter, men may be capable of effecting, though not of the former. Though admitting internal conversion is meant, God’s requiring it does not suppose man’s ability to perform it, but his need of it; and is done with a view to bring him to a sense of his state, and that he may apply to God for it, as Ephraim did. Nor does such a prayer for conversion excuse men from obligation to turn to the Lord, or any duty respecting the outward walk and conversation; so far from it, that converting grace, when obtained, puts men into a capacity, and engages them to live soberly, righteously, and godly in this world. And whereas it is added, "that by comparing this prayer with the preceding chapter, in which God promises so oft to turn their captivity, it appears this is only a prayer that God would bring them out of that thralldom, like that of the Psalmist (Ps. 126:4)." Let it be observed, that this is a sense which the Jews themselves, who are ready to explain scriptures this way whenever they have the least opportunity, do not give into. The Targum paraphrases the words thus, dnxlwpl anbyta, turn us to thy worship. Kimchi observes, that it is as if it was said hbwvtb yklbq, receive me by repentance. Besides, it is plain, that what Ephraim here prayed for, he quickly had, as appears from verse 19, upon which followed true repentance; and being a dear son, and pleasant child to God (v. 20), he comforts him by assuring him that he would have mercy on him; and as an evidence of it, bids him turn again to his cities, which indeed designs the turning of his captivity: but then this is manifestly distinguished from the turning Ephraim prayed for, and which he enjoyed before he had this encouragement to turn to his cities. 4. The Remonstrants41 formerly paraphrased the words thus: "As thou hast chastised Ephraim, O Lord, so chastise me; for though I am in part chastised, yet chastise me more and more:" and they farther suggest, "that they do not intend first conversion; since he being converted prays." In which may be observed, that this sense of the text introduces another person, speaking to the Lord, besides Ephraim, contrary to the express words, and plain reading of them: nor is the word bwv, here translated turn, ever used for affliction or chastisement in all the word of God, though sometimes for deliverance from it: nor is there any command, or example of men’s praying for affliction; for though they sometimes pray, that afflictions maybe sanctified, and that they may be supported under or delivered from them, yet never, that they may be brought upon them, or increased. And as to what is intimated, that the text is not to be understood of first conversion, being the prayer of a converted man; it may be replied, that it does not appear that Ephraim (for no other person can be meant) was then converted, at least in his own apprehensions, but afterwards (see v. 19). Moreover, Ephraim is to be understood not of a single person, but of a body of men; many of whom, and it may be the greatest part, were not converted: nor is his praying a sufficient evidence of his conversion; since a natural man is capable of praying, and of praying for conversion, under some awakenings of conscience. But be it so, that Ephraim was converted, and that he prayed not for the first work of conversion, but for the farther progress and carrying of it on, or for a renewal of it after backslidings; yet if this could not be done by himself, but required the grace and power of God; much less can the: first work of conversion be wrought by a graceless creature; and much more must that work require the powerful and efficacious grace of God. These phrases of putting, and writing the law of God in the inward parts of the heart, do not mean barely a making known the nature of the moral law, as to the spirituality and perfection of it, or the glory and excellency of the gospel, its truths and ordinances; but a creating in the soul a real and heart affection for these things, and a subjecting of it to them by the power of divine grace; and indeed, are expressive of an internal work of the powerful grace of God upon the soul, in which man is as passive as a vessel is, in which any thing is put; or as paper and parchment on which any thing is written. Now, to this the following things are objected. 1st. That "these promises are made expressly to the whole house of Israel, to all with whom the old covenant was made, and whom God brought out of Egypt, and would bring again out of captivity; and therefore can be no covenant made with the elect of the house of Israel and Judah; because then the whole nation of the Jews must have been elected and converted; and because it is made with those who kept not his former covenant; whereas the elect always persist, say these men, in their covenant with God; this therefore can be no new covenant with them. "42 To which I reply, that these promises are not made to the same individual persons, not to all, nor to any, with whom the old covenant was made, whom God brought out of Egypt, and whose carcasses fell in the wilderness, but their posterity; for it is expressly said in verse 32, that this new covenant is not according to the covenant that God made with their fathers in the day he took them by the hand to bring them out of the land of Egypt. And though they are made to the house of Israel, yet they are not said to be made to the whole house of Israel, and to all the children of Israel and Judah; and therefore might be made to the elect of the house of Israel. Whence it does not follow, that the whole nation of the Jews must have been elected and converted; nor was it made with those who kept not the former covenant; nor do we say that the elect always persist in their covenant with God; for we know that the covenants, vows, and promises they make, are often broken; but we say, that they always abide in God’s covenant with them, and are always his people, and he their God; and which notwithstanding is a new covenant to them, especially under the gospel-dispensation, to which these promises refer, being under a new mode of administration, and always new in perpetual force and vigor. Besides, the house of Israel, and the house of Judah, may be taken literally or figuratively; if literally, this prophecy concerning them was accomplished in the times of Christ and his apostles, who first preached the gospel, and made known the new covenant of grace to the Jews; many of whom were converted under it, the gospel being the power of God unto salvation, to the Jew first, and also to the Greek (Rom. 1:16): they may be taken figuratively, and design the elect of God, whether among Jews or Gentiles; for as there was an Israel after the flesh, so there was one after the Spirit: even the whole Israel of God, the chosen vessels of salvation, to whom the new covenant and all the blessings of it peculiarly belong. 1. "That he would clearly make known his will to them, so that they need not be at much pains to find it out, as in Deuteronomy 30:11-14, Romans 10:8, 2:14." To which I answer, that though these words import a clear and plain discovery of God’s will, yet that is not all; for there may be, and is a clear and plain revelation of God’s will externally made in the scriptures, and by the ministry of the word to some persons, in whose hearts nothing is internally put or written: whence it follows that putting and writing the law of God in the heart, is something more, and what is distinct from, a bare making known the will of God, though never so clear and plain; and must intend an internal operation and application of God’s grace. Moreover, where the knowledge of God, of his grace, mind and will, is spiritual, experimental, and saving, that follows upon, and is the fruit and effect of the putting and writing the law in the heart, as appears from the following verse; and is owned by the author of this exception. Once more, when the Gospel, which is the grand revelation of God’s will, has a place in the hearts of any, it is owing to the powerful and efficacious grace of God that accompanies it, opens the heart, and lets it in; where it; is not only clearly known, but affectionately received, experimentally felt, and truly believed. 2. "And44 inculcating them on the soul by the Holy Spirit, so as that they may be still fresh upon the memory; (Deut. 6:6; 11:18, Prov. 3:1, 3). Whence it follows, that these promises cannot be so understood, as if God by them engaged to do the whole work, which he hath engaged us so expressly to perform." To which I reply, that the persons spoken to in the cited passages were not unconverted persons, but such who had been under the first work of conversion: and the phrases of laying up and writing the laws of God in their hearts intend more than a bare remembrance of them, even a strong affection for them, and close attachment to them; so the sin of Judah is said (Jer. 17:1) to be graven upon the table of the heart, which does not intend their consciousness of it, and the keeping of it in their memory; but on the contrary, stupidity, insensibility of it, indolence about it, and a stiff tenacious adherence to it, as well as affection for it. And should these phrases intend no more here, can it be supposed, that there should ever be an affection for the law of God, or a close adherence to the Gospel of Christ, in such whose carnal minds were enmity to God, and not subject to the law of God, nor could they be, without the powerful operation of God’s mighty grace? Since then these words import, besides a dear knowledge of the law and Gospel, and an imprinting the eternal truths of both in the mind, a hearty affection for them, which issues in a professed subjection to them; this must be owing, not to the power and will of man, but to the unfrustrable and insuperable grace of God. And this objector owns, that the inculcating, them on the soul must be purely passive. The passage in Jeremiah 32:49, will be considered under the head of the saints’ perseverance. 1. It is said,46 if it "respects their return from the Babylonish captivity, it must be conditional, the books of Ezra and Nehemiah, and especially the complaints of the prophet Malachi, showing that they were never fulfilled in many of them, and from Ezekiel 11:21." To which I answer, that these promises were not made to all the people of Israel, as has been observed; therefore there needed no condition to he either understood or expressed either in this or in the parallel text, to suit them to these people and times; for, though the people was wicked who returned from captivity, yet there was not only an external reformation made among them, but an inward sense of things was given to a large number of them, as appeared at the reading of the law to them by Ezra. And it may be observed, that the people was never so addicted to idolatry after their return from their captivity as before; so that the promises in this and the preceding verse had a considerable accomplishment at this time. 2. Moreover, it is also objected,47 that "according to this exposition it must follow, that not one good man came out of the captivity, not one of them with a new or a clean heart; but all of them with a heart of stone, which was to be taken away." I reply as before, that these promises were not made to them all; and therefore the consequence does not follow. Besides, some good men might, as no doubt did, come out of the captivity; though the majority might be wicked, who stood in need of the things promised. Moreover, good men stand daily in need of being renewed in the spirit of their minds, and often of having clean hearts created, and right spirits renewed in them. 3. It is also suggested,48 that this promise "relates to the conversion of the Jewish nation yet to come, and to them alone; and therefore all Christians may as well expect to be exempted from famine (v. 30), and to have increase of corn (v. 27), and their waste places and fenced cities built (vv. 33, 35); as the other blessings promised here." To which I answer, that though the temporal blessings here promised were peculiar to the Jews, yet the spiritual ones are such as all real Christians not only may expect, but have; and therefore, admitting that the words refer to the time of the conversion of the Jews, inasmuch as Gentile believers are made partakers of the same spiritual blessings and promises, are called in the same hope of their calling, and saved by the same grace of the Lord Jesus, as the Jews will be; there is all the reason imaginable to conclude, that they are regenerated and converted by the same grace and power; God not making use of two different methods of conversion, one among the Jews, and another among the Gentiles. "1. From verse 12, where we are commanded to work out our own salvation, in which we cannot be purely passive; nor is it a reason, that God works in us both to will and to do, why we should, but rather why we should not will, or work at all; if both is and will be irresistibly performed without us. We are also bid to do this will fear an trembling; but surely, if God unfrustrably works in us both to will and to do, there can be no possibility of miscarrying, and so no ground for fear and trembling. Besides, the Philippians were exhorted to do this much more in St. Paul’s absence than in his presence. The only reason of which is, that he being present, stirred them up by his counsels and exhortations to do what was according to the mind of God, to which they in his absence were immediately excited by the suggestions of the Holy Spirit." To all which I reply, that the salvation the apostle I exhorts the Philippians to work out was not the spiritual and eternal salvation of their souls in general, nor the work of conversion in particular, which was already wrought in them; but the duties of religion, or things which accompany salvation, as has been shown in the former52 part of this work; in which they might be active, though in the good work of grace upon their souls they had been passive. Nor could any thing be a greater encouragement to them, to be active in the discharge of duty, than this; that God had laid in them principles of action, had wrought in them both to will and to do. The fear and trembling, with which they were to do these things, is not a slavish fear lest the work of grace should miscarry, but a reverence of the Divine Being, and humility of soul, which become believers n the performance of every religious action and as for their obeying, much more in St. Paul’s absence than in his presence, this is no part of the exhortation, but is prefaced to it by way of commendation, in order to animate and excite them to it with more diligence and cheerfulness. After all, if God works in us not by an unfrustrable operation, but by an operation frustrable by the will of man, how does he work in us both to will and to do of his good pleasure? 2. It is observed53 that the word evnergei/ doth not require this sense is evident; "because in Scripture it occurs very often, when it must be understood not of a physical, but only of a moral operation (as in Eph. 2:2; 2 Thess. 2:7,9,11; Heb. 4:12; 1 Thess. 2:13; Gal. 5:6; Philemon 6; Rom. 7:5)." I answer, that this word always signifies a powerful and efficacious operation, agreeable to the nature of the person or thing which is said to work; so Satan and Antichrist are said to work (Eph. 2:2; 2 Thess. 2:7, 9), and that effectually, with all power and lying wonders; so the word of God is powerful, and world effectually in them that believe (Heb. 4:19; 1 Thess. 2:13), when it comes not in word only, but also in power, and in the Holy Ghost; or when it is clothed with a divine power, though the former of these texts seems rather to be understood of Christ, the essential Word, than of the written word. So faith is said to work by love (Gal. 5:6), and the communication of it, and not charity, to be effectual (Philemon 1:6), when by the secret power of the Spirit it is influenced, and drawn forth into exercise, and shows itself by love and good works. So the motions of sin, in the hearts of unregenerate men, work powerfully, effectually, and without control, to bring forth fruit unto death (Rom. 7:5). And, where this word is made use of to express any action of God’s, it always signifies such an operation as is not to be frustrated, or made void )see Eph. 1:11; 3:20; Phil. 3:21; Col. 1:29), and that it has this signification in the text before us is evident, both from the general sense of the word, and the nature of the work. Add to this, in the King’s manuscript54 the words are read o` evnergw/n o` guna,mei evn u`mi/n, who worketh by his power in you; therefore, not by moral persuasion, but by the mighty power of his grace. 3. It is said,55 "that both these places speak of men already believing, and converted; and therefore must be impertinently alleged to prove men must be purely passive in the work of conversion." But admitting this, which will be readily done, the allegation of them is not impertinent; since, if persons already believing and converted, are not able either to will or to do any thing spiritually good of themselves, much less able must unconverted persons be. And if so much is required to work in them both to will and to do, how much more is requisite in the regeneration and conversion of a dead sinner? And if the saints are so passive under the exertions of that power which enables them to act, insomuch that they do not and cannot act until it is put forth, much more must they be passive in the first production of the work of grace upon their souls. 1. It is excepted,56 "that the apostle manifestly speaks here of those extraordinary gifts of the Spirit, the gifts of tongues and prophecy, etc., which being infused without human industry, and conferred on Christians without any such cooperation of their faculties as is required to the exercise of any Christian duty or moral virtue, it cannot with like reason be inquired of these duties, as it may be of those gifts, Who made thee to differ from another in them? Nor can it from them be duly inferred, that no man doth any thing to make himself differ from another in any virtue or pious disposition, to which men are stirred up by powerful motives, and praised by God for doing what others neglected to do; as in the case of the Bereans, the elder and the younger son, the publicans and harlots, compared with the scribes and Pharisees, the penitent publican and the proud Pharisee." To which may be replied, that there is not the least syllable said by the apostle, either in the text or context, of the gift of tongues, or of any other extraordinary gift of the Spirit; nor is he speaking to ministers, or of any gift of theirs, by which they were distinguished from other men, or from one another; but to private Christians, the members of the church at Corinth, who were striving about and boasting of their ministers, and crying up one to a neglect and contempt of another: one valued himself upon his being converted under such a man’s ministry, and being baptized by him; another under another man’s ministry, and being baptized by him, and of the good judgment each of them had formed, and the choice they had made of their respective ministers; wherefore, the apostle (1 Cor. 4:6) exhorts them not to think of men above that which is written, that no one of them be puffed up for one against another, that is, for one minister against another; for, adds he, who maketh thee to differ? Some of you have been converted raider this, and some under that man’s ministry; but these men have been only instruments in your conversion; it is God, who, by his grace, has made the difference between you and others; and if you have enjoyed any blessing under their respective ministrations, you have received it from God; and, therefore, should not glory either in yourselves or in them, but in God, who has distinguished you by his favors. Now, since the apostle speaks not to ministers, but to the body of the people, it does not appear that he manifestly speaks of the extraordinary gifts of the Spirit: for were they all workers of miracles? (1 Cor. 12:29, 30). Had they all the gifts of healing? Or could they all speak with tongues, or all interpret? Besides, suppose the apostle does here speak of extraordinary gifts; since true saving grace in conversion is preferable in its nature and use to them all, and God is allowed to make a difference by the one, why not by the other? Shall we allow him to make a difference in and by the lesser instance of his favors, and not in the greater? Moreover, the apostle does not expressly instance in any one particular thing, but in general inquires, Who maketh thee to differ? in any thing, in any one instance whatever: What hast thou that thou didst not receive? nothing at all; and therefore holds good, and is equally true of the difference made in conversion, and of the blessings then bestowed, as of any thing else. As to Christian duties, or moral virtues, in the exercise of which men distinguish themselves from one another, that is not the point in question. The question is not, whether men may make themselves to differ from others in the performance of these things, but, whether one man, by the power of his free will, can make himself to differ from another in conversion; this difference, we affirm, is owing to the efficacious grace of God. Besides, the performance even of these things, in a spiritual manner, is not owing to the power of men’s free will, or barely to the exciting grace of God, or to men’s being stirred up to them by motives, but to the powerful grace of God enabling them so to act. What was it else but this grace, which so powerfully operated in the Bereans, as that they received the word readily, and searched the Scriptures with so much diligence, which remarkably distinguished them from the Thessalonians? Was it not the grace of God which enabled the elder son to repent and go and work in his father’s vineyard, when the second or younger son was left to his own free will, and the bare resolutions of nature? To whom can it be ascribed, but to him who has the key of David, who opens and no man shuts, and shuts and no man opens, that publicans and harlots should go into the kingdom of God before the self-willed scribes and Pharisees? And it was nothing less than the powerful grace of God which wrought in the heart of the penitent publican, and made him so; which gave him the sense he had of himself, and of his need of mercy through a mediator, which rendered him more acceptable to God than the proud Pharisee. 2. "To the question, when two are equally called and one converted, Who is it that puts the difference? it is said,57 the answer, grounded on God’s own righteous judgment, will be this: that man puts the difference, and not God only, because God judges not his own acts, but the acts of men." I reply, that this is a very improper answer to the question; which is not when two men are before the judge, the one is condemned and the other acquitted, who puts the difference? But when two men are equally called by the external ministry of the word, the one is converted and the other not, who makes the difference? The methods God takes in conversion, and which he will take in the last judgment, are very different, as the things themselves are; in the former, he proceeds according to his justice. Men will be judged according to their works, but none are saved, or called, or converted by them, or according to them; in conversion he makes a difference, in the future judgment he will find one, and act according to it. Men will be considered, in that awful day, not barely as converted or unconverted persons, but as righteous or sinners; none will be condemned because God did not convert them or call them by his grace, but because they sinned against his law. On the other hand, the saints will be acquitted as righteous persons, through the righteousness of Christ, which gives them a title to heaven, and for which regenerating and converting grace makes them meet. "Faithis not here called the gift of God,58 but salvation by grace through faith." I reply, admitting that the apostle does not so immediately refer to faith in particular, but to salvation in general, as the gift of God; yet, since this salvation is wholly of grace, and not of works, is through faith, not as a work, having any casual influence, but as a mean of God’s appointing, it cannot stand excluded from being a gift of God; nor is this the only place in which it is so called (see John 6:65, Phil. 1:29). 1. It is said,59 that the phrase, Ye are saved by grace, "cannot mean that they are actually saved, but only that they were called to a state of salvation, enjoyed the means, and were put into the way of salvation by grace." But, why not actually saved? Since salvation was not only in God’s purpose appointed for them, and was actually wrought out and obtained for them by Christ, but was also brought home, and really applied to their souls by the Spirit of God; so that they were now saved according to the mercy of God, by the washing of regeneration, and the renewing of the Holy Ghost (Titus 3:5). Besides, if all such may be said to be saved by grace, who are externally called, or enjoy the means, the gospel of the grace of God; then unbelievers, as well as believers, such who put away the word of God from them, as well as they that receive it, such to whom it is the savor of death, as well as those to whom it is the savor of life, may be said to be saved by grace. 2. It is affirmed,60 that "though actual salvation depends upon good works, or sincere obedience, and though faith is the condition of justification, and good works of salvation, yet is all boasting utterly excluded; because the revelation, which contains the matters and motives of faith, and the miracles which engage to it, is the free gift of God; and because the good works we do, proceed not from ourselves, but are the fruits of faith, and performed in the strength of God. It is of his preventing and exciting grace that we will, and of his assisting grace that we are enabled to perform that will: and it is still of grace that any of these things, which deserve nothing from God, find acceptance with him." I am very glad to observe, that all these things, last-mentioned, are earned to arise from the grace of God; which is far from agreeing with the scheme our author contends for throughout this performance of his, and contradicts the notion of salvation depending on good works; which notion is against the express letter of the text before us, as well as thwarts many other passages of Scripture (see Rom. 3:20,28; 2 Tim. 1:9; Titus 3:5). Moreover, if actual salvation depends on good works, man has something to boast of; boasting is not excluded by the law, or doctrine of works, that is, by the doctrine of salvation by works; if Abraham, or any other man, were justified by works, he hath whereof to glory (Rom. 3:27; 4:2). 3. It is observed,61 "that the Scripture plainly grants that there is kau>chma, or matter or glorying, in things done by the assistance of the grace of God (as in 1 Cor. 9:15; 2 Cor. 11:10; 1:12; Gal. 6:4)." I reply, that the words kau,chma, and kaucaomai, are used by the apostle Paul,62 and do not signify an ascribing anything to one’s self, as proud boasters do; but a satisfaction, pleasure, and exultation of mind, as in the places referred to. The two first of which (1 Cor. 9:15; 2 Cor. 11:10), respect his preaching of the gospel, and not barely that, but the preaching of it without charge; which upon reflection, for many reasons, gave him an inward pleasure and satisfaction, and at the same time he declared, that though he preached the gospel, he had nothing to glory of. The next passage cited from 2 Corinthians 1:12, regards the agreeable life and conversation of the apostle, and other ministers in the world; which he attributes, not to fleshly wisdom, then there would be room for glorying; but to the grace of God, which was matter of rejoicing, though not of vain boasting. The last of these scriptures, Galatians 6:4, regards also the external conversion of the saints; which, when agreeable to the gospel of Christ, yields a pleasing reflection within a man’s self; so that betas no need to look out to others, to borrow any glory from them, by comparing himself with them, as the proud Pharisee did, when he said, God I thank thee that I am not as other men are, extortioners, unjust, adulterers, or even as this publican. 1. This is thought63 to be "sufficiently accounted for by observing, that the principle, by which man cooperates with him in this work, is derived from him; and all the motives which excite this principle to act, arise purely from God’s preventing and exciting grace." I confess, this is owning a great deal, but not enough: for this principle is not barely derived from God, but implanted by him; in which man is purely passive, and does not nor can he cooperate with him in the production of it. Moreover, though the motives which excite this principle to act are from the Lord, yet they must be attended with the powerful grace of God, or they will never excite the principle to act. Betides, though man is an agent, and acts for God, and his glory, under the influence of grace, in consequence of a principle of it wrought in him, yet he is no agent in the forming of that principle; were he, though an under one, part of the glory of it would belong to him; wherefore if God is chief agent, yet, if not a sole one in this work, the whole glory of it is not due to him. 2. It is observed,64 that "our Lord, and his apostles, often commend the good actions of men; and Christ will at last say to the righteous man, Well done, thou good and faithful servant." But then it should be observed, that these praises and commendations do not regard the work of grace and conversion, but the fruits of it in the lives and conversations of the saints; which though God, of his great grace and goodness, is pleased to praise, commend, and signify his acceptance of, yet these persona are taught by the same grace to own, that when they have done all they can, they are but unprofitable servants; and that it is by the grace of God they are what they are, and do what they do (Luke 17:10; 1 Cor. 15:10). And when Christ at the last day shall speak of their good works, and say to them (Matthew 25:35, 37), I was an hungered, and ye gave me meat, I was thirsty, and ye gave me drink, etc., they will reply, as having forgotten them, putting no trust in them, or ascribing the glory of them to themselves, When saw we thee an hungered, and fed thee; or thirsty, and gave thee drink? &c.
Whitby, p. 272; ed. 2. 266. Ibid. Vide Colt. Hag. art. in. and 4:p. 293, 294; Limborch, p. 388. Whitby, p. 272; ed. 2.266. Whitby, p. 273; ed. 2.266. Ibid. p. 273, 274; ed. 2.267. Whitby, p. 274, 275; ed. 2. 268. Whitby, p. 275; ed. 2. 268. Talm. Jebamot, fol. 22:1, 48:2, 62:1, and 97:2. Vide Maimon. Issure Bia, c.14, s.11; and Eduth. c.13, s. 2. Whitby, p. 276; ed. 2. 269. Whitby, p. 276, 277; ed. 2.270. Remonstr. Act. Synod. circ. art. 4:p. 159; Curcellaeus, p. 38; Limborch, p. 28, 382. Whitby, p. 177; ed. 2.270. Ibid. p. 277, 278; ed. 2.271. Whitby, p. 278; ed. 2.271. Whitby, ibid. ; Remonstr. Act. Synod, circ. art. 4:p. 168; Limborch, p. 383. Whitby, p. 279; ed. 2.272. In Talmud, Avoda Zara, fol. 24, vol. 1. Whitby, p. 280; ed. 2 273. Whitby, p. 280; ed. 2.273. Whitby, p. 283; ed. 2.276. Whitby, p. 283-285; ed. 2.276-278. Whitby, p. 285; ed. 2. 278. Whitby, p. 285, 286; ed. 2.279. Whitby, p. 286, 287; ed. 2.279, 280. Ibid. p. 217; ed. 2.280. Whitby, p. 288; ed. 2.281. In Coll. Hag. art. in. iv:266. Whitby, p. 288, 289; ed. 2.281, 282. Whitby, p. 289; ed. 2.282. Ibid. p. 290; ed. 2.282. Whitby, p. 292; ed. 2.284. Whitby, p. 292, 293; ed. 2.285. Whitby, p. 295; ed. 2.286, 287. See Grotius and Hammond, in loc. Whitby, ibid. ; Curcell. p. 410; Limborch, p. 387. Whitby, p. 296; ed. 2.288; Remonstr. in Coll. ling. art. 2,4. p. 316; Limborch, p. 389. Whitby, p. 297; ed. 2.289. Remonstr. in Coll. Hag. art. in. & 4: p. 306; Curcell. p. 465. Whitby, p. 210, 297; ed. 2.204, 290. Whitby, p. 298; ed. 2.290. Ibid. p. 299; ed. 2.292. Vide Bess, in Galatians 6:14. Whitby, p. 300; ed. 2.292. Ibid. p. 301; ed. 2.294. All rights reserved under International and Pan-American Copyright Conventions. By payment of the required fees, you have been granted the non-exclusive, non-transferable right to access and read the text of this e-book on-screen. No part of this text may be reproduced, transmitted, downloaded, decompiled, reverse engineered, or stored in or introduced into any information storage and retrieval system, in any form or by any means, whether electronic or mechanical, now known or hereinafter invented, without the express written permission of Monergism Books.